Liverpool has so many fabulous wedding venues! Wouldn’t you agree? Sometimes you might not even realise that a venue does weddings. Sometimes you might not even realise a venue is there! I’ve spoken to so many scousers over the years that didn’t know that right in the heart of the city was the Bluecoat. A fabulous historic, quirky wedding venue. Bluecoat is Liverpool’s centre for the contemporary arts, situated in the heart of the city in Liverpool’s oldest building. Built in 1717 Bluecoat is a Grade One listed building and part of the UNESCO World Heritage site. Bluecoat presents the perfect mix of historic beauty and heritage features with a bold contemporary twist. We pride ourselves on creating the perfect day for you and your guests. What types of couples get married at Bluecoat? All of our couples are amazing and its really lovely to see the genuine love they have for each other. We have a whole mix of ages, sexual orientation, and styles. The beauty of the Bluecoat is that it has a meaning and memory to people in their own unique way. We host around 20 -25 weddings a year and can accomodate small intimate weddings right up to 250 guests for an evening reception. Budget wise it works out averagely at around £5k, although we have weddings come to us with much smaller and larger budgets. We are happy to work with couples to meet their individual budgets and tailor the offering to them. We do offer a bespoke service which has always been a bonus for our couples. One of the unique things about Bluecoat is the number of rooms you have to choose from for your wedding celebration! We have two rooms on the ground floor called the Sandon room and Garden room. These spaces are ideal for wedding ceremonies up to 75 guests and are also the perfect setting for a small wedding breakfast and evening celebration. The Sandon room has a baby grand piano and a beautiful view of the private small courtyard. The courtyard and gardens are all directly accessible from these rooms, making them ideal for summer weddings. Upstairs at the Bluecoat is a grand restaurant with original Georgian Sash Windows. It has a 30ft bar and makes an ideal setting for a drinks reception, wedding breakfast and evening reception. 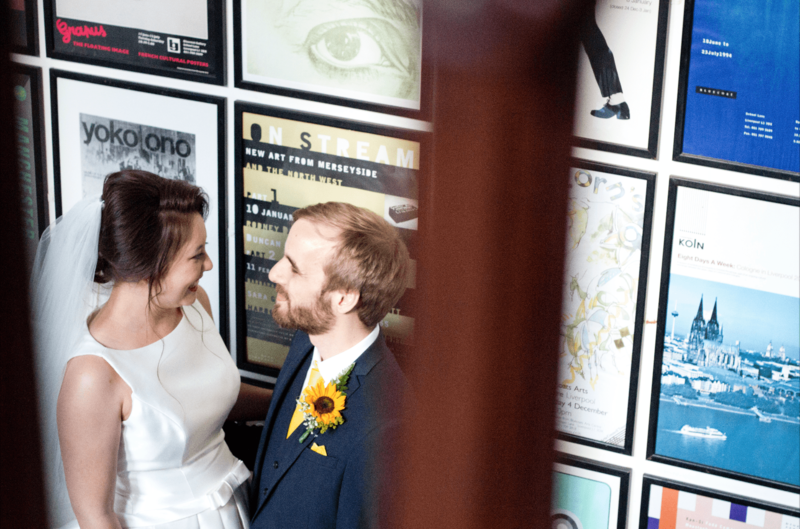 It is the most popular space for weddings at Bluecoat. It definitely makes a big impression when it’s fully dressed for a wedding celebration. It can accommodate up to 100 guests for a sit down meal and 150 guests for an evening reception. The Performance Space makes for a striking ceremony space for up to 120 guests, it can then be the main hub for wedding celebrations in the evening. It’s perfect for bands, dj’s and dancing. It allows the total capacity for an evening reception to reach 250 guests between the two spaces. We have a selection of menus that we feel will meet most couples styles. The sharing boards for the wedding breakfast look great and put a modern twist on the traditional 3-course meal. However, saying that the 3-course wedding breakfast is still our most popular choice. We have an in-house kitchen team with a wealth of experience. They develop the menus using local produce and popular dishes. We also offer a drinks package that includes a Pimp your Prosecco and Pimp your Gin! I love this as the guests are free to create their favourite concoction or try something new! It’s interactive and gets the guests mingling and ready to celebrate. What makes your venue truly special? The Bluecoat is just special, its one of a kind. It holds so many enterprises and visions, its always changing and evolving. The people who work at Bluecoat make it so friendly and welcoming. The biggest compliment we receive from our wedding couples is always the staff! oh and the food! We’ve been here for 300 years and we’re planning on being here for the next 300! Wow! I wonder what Liverpool will look like in another 300 years?! How far in advance should couples book with you? Anytime is good for us, our shortest lead wedding was 6 weeks! It was fantastic. To book you can contact us via phone or email – 0151 702 5324 janine.c@thebluecoat.org.uk. Why not take a look around for yourself? Click here for a virtual tour by Capture VR. Stay tuned because later this week we’ve got a bumper post of inspiration for you for weddings at Bluecoat! Make sure you take a look! Wedding Stationery - Can You Budget for it? Christmas Weddings! - Our Christmas Wedding Planning tips! Wedding Hair Styles to Go With Hats – Love Your Hat Hair!